Congratulations to Doctor Adagio for winning the Create-a-Coat Contest! Doctor Adagio will be receiving L$5,000 in-world, as well as an “8 for 4 Weeks Kibbles”, an Eternal Pet Crystal, and a Kaiser LE Den with a few random traits on it. We also had 3 Runner Ups! In no particular order: efesto Spires, Cherrycherrygirl Resident, Spibe Resident are all winners of L$500, “4 for 4 Weeks Kibbles” as well as an Eternal Pet Crystal! There were also 17 other entrants – each and every one of them will be receiving an Eternal Pet Crystal! There were lots of great ideas submitted, so we thank each and every one of you for entering. There’s bound to be another one of these contests later on – so check back in often with our news page. If you submitted an entry, please look under the “Objects” folder of your “Second Life Inventory”, you should see the Fennux Eternal Pet Crystal delivered there. We will have sent all of these out by May 1, 2015 @ 1:00AM SLT. The May 2015 LE “Kaiser” Limited Edition Fennux Coat is here! NOTE: THE LE SPECTRUM EYES ARE VERY RARE, DO NOT EXPECT TO GET THEM, BUT IF YOU DO GET THEM – CONGRATULATIONS! And that’s all there is to it! Enjoy your Kaiser LE Fennux Den, and your 12 Days of Reserve Food! WHERE DO I GET MY KAISER LE FENNUX? The Wishing Well exists only on the Fennux Sim. We have 1 setup next to every Crafting Machine, and of course these Wishing Wells are used to turn any 12 Fennux Dens into 1 Kaiser LE Den (and 12 days of Reserve Food). Yes there is a SMALL CHANCE to get “LE Spectrum Eyes”, but the odds are roughly about a 0.5% chance to obtain, so don’t expect to get them! The LE Spectrum Eyes can pass onto other coats, so even if you don’t get them from Wishing, you will have opportunities to obtain them in the Secondary Market later. Most Fennux however will have regular eyes from a starter den, very similar to Crafting – the only thing that is “LE” on most Kaiser LE Fennux is the over-ride of the Fennux Coat. It’s more-or-less exactly like Crafting, except for the fact the coat will not pass. It’s time for another Create-a-Coat Contest! Have you ever wanted to make your own Fennux coat? We are having a contest where anyone can download our Fennux Silhouette PNG file, import it into Photoshop or Gimp or whatever your favorite Image Editing Software is, and then you can draw, paint bucket, brush, etc. on the Fennux Silhouette PNG file. You do NOT have to be a 3D Texture Artist to submit an idea, you just need to know how to paint on a 2D surface! It’s really that easy – get as creative as you want and once you’re done save the file (JPG/JPEG PREFERABLY), upload it to Second Life, make it Full Perm (mod,copy,trans) and send it to Daemon Blackflag in-world. Please try to only submit one entry! Daemon and other members of Team Fennux will review your ideas and choose a winner. Then, Katharine Mcginnis will use her texturing expertise to recreate the winning conceptual idea and turn it into a real Fennux Coat! We will not announce the winner until around the 1st of May – because that is when we intend to release the coat into the Wishing Well. Yes, the winner’s coat will be available in the Wishing Well as an LE for the entire month of May. SO PLEASE THINK OF IDEAS BASED AROUND “MEMORIAL DAY”, “MILITARY”, “FALLEN HEROES”… or maybe you can be a bit creative and think outside the box completely, the choice is yours! If you are not selected this time, don’t worry! This isn’t the first time we’ve done this, and we plan to do it more often. Upon submitting your contest entry to us – Team Fennux becomes the sole owner of your idea, and we can use it as we see fit forever. This is traditional legal jargon, if we didn’t say this we couldn’t release your coat into the wild, and now we can! DEADLINE: April 21, 2015 – Please do not send anything after this date!!! The April 2015 “Candy” Limited Edition Fennux Coat is here! And that’s all there is to it! Enjoy your Candy LE Fennux Den, and your 12 Days of Reserve Food! WHERE DO I GET MY CANDY LE FENNUX? The Wishing Well exists only on the Fennux Sim. We have 1 setup next to every Crafting Machine, and of course these Wishing Wells are used to turn any 12 Fennux Dens into 1 Candy LE Den (and 12 days of Reserve Food). Most Fennux however will have regular eyes from a starter den, very similar to Crafting – the only thing that is “LE” on most Candy LE Fennux is the over-ride of the Fennux Coat. It’s more-or-less exactly like Crafting, except for the fact the coat will not pass. The April 2015 “Chomper” Limited Edition Fennux Coat is here! NOTE: THE LE ONYX EYES ARE VERY RARE, DO NOT EXPECT TO GET THEM, BUT IF YOU DO GET THEM – CONGRATULATIONS! And that’s all there is to it! Enjoy your Chomper LE Fennux Den, and your 12 Days of Reserve Food! WHERE DO I GET MY CHOMPER LE FENNUX? The Wishing Well exists only on the Fennux Sim. We have 1 setup next to every Crafting Machine, and of course these Wishing Wells are used to turn any 12 Fennux Dens into 1 Chomper LE Den (and 12 days of Reserve Food). Most Fennux however will have regular eyes from a starter den, very similar to Crafting – the only thing that is “LE” on most Chomper LE Fennux is the over-ride of the Fennux Coat. It’s more-or-less exactly like Crafting, except for the fact the coat will not pass. The March 2015 “Optics” Limited Edition Fennux Coat is here! And that’s all there is to it! Enjoy your Optics LE Fennux Den, and your 12 Days of Reserve Food! WHERE DO I GET MY OPTICS LE FENNUX? The Wishing Well exists only on the Fennux Sim. We have 1 setup next to every Crafting Machine, and of course these Wishing Wells are used to turn any 12 Fennux Dens into 1 Optics LE Den (and 12 days of Reserve Food). Most Fennux however will have regular eyes from a starter den, very similar to Crafting – the only thing that is “LE” on most Optics LE Fennux is the over-ride of the Fennux Coat. It’s more-or-less exactly like Crafting, except for the fact the coat will not pass. Dash and I just ran through a bunch of stuff to get things more on track. We have a brand new FNX Point Redeemable LE with Eyes! And that’s about it, obviously we’re scheduled for a new Wishing Well LE on March 1st, and who knows what else is bound to happen. Congratulations to OdettePearll Resident for winning the Create-a-Coat Contest! OdettePearll Resident will be receiving L$5,000 in-world, as well as an “8 for 4 Weeks Kibbles”, an Eternal Pet Crystal, and a Valenberry LE Den with a few random traits on it. We also had 3 Runner Ups! In no particular order: GoldSilverKnight Resident, AthenaAndros Resident, Xenophile Neurocam are all winners of L$500, “4 for 4 Weeks Kibbles” as well as an Eternal Pet Crystal! There were also 21 other entrants – each and every one of them will be receiving an Eternal Pet Crystal! There were lots of great ideas submitted, so we thank each and every one of you for entering. There’s bound to be another one of these contests later on – so check back in often with our news page. If you submitted an entry, please look under the “Objects” folder of your “Second Life Inventory”, you should see the Fennux Eternal Pet Crystal delivered there. We will have sent all of these out by February 1, 2015 @ 1:00AM SLT. The February 2015 LE “Valenberry” Limited Edition Fennux Coat is here! NOTE: THE LE GLACIER EYES ARE VERY RARE, DO NOT EXPECT TO GET THEM, BUT IF YOU DO GET THEM – CONGRATULATIONS! And that’s all there is to it! Enjoy your Valenberry LE Fennux Den, and your 12 Days of Reserve Food! WHERE DO I GET MY VALENBERRY LE FENNUX? The Wishing Well exists only on the Fennux Sim. We have 1 setup next to every Crafting Machine, and of course these Wishing Wells are used to turn any 12 Fennux Dens into 1 Valenberry LE Den (and 12 days of Reserve Food). Yes there is a SMALL CHANCE to get “LE Glacier Eyes”, but the odds are roughly about a 0.5% chance to obtain, so don’t expect to get them! The LE Glacier Eyes can pass onto other coats, so even if you don’t get them from Wishing, you will have opportunities to obtain them in the Secondary Market later. Most Fennux however will have regular eyes from a starter den, very similar to Crafting – the only thing that is “LE” on most Valenberry LE Fennux is the over-ride of the Fennux Coat. It’s more-or-less exactly like Crafting, except for the fact the coat will not pass. It’s really that easy – get as creative as you want and once you’re done save the file (JPG/JPEG PREFERABLY), upload it to Second Life, make it Full Perm (mod,copy,trans) and send it to Daemon Blackflag in-world. Please only submit one entry! We will not announce the winner until around the 1st of February – because that is when we intend to release the coat into the Wishing Well. Yes, the winner’s coat will be available in the Wishing Well as an LE for the entire month of February. SO PLEASE THINK OF IDEAS BASED AROUND “VALENTINE’S DAY”, “LOVE”, “HEARTS”, “RED/PINK/WHITE/BLACK”… or maybe you can be a bit creative and think outside the box, the choice is yours! DEADLINE: January 21, 2015 – Please do not send anything after this date. The January 2015 “Novus” Limited Edition Fennux Coat is here! And that’s all there is to it! Enjoy your Novus LE Fennux Den, and your 12 Days of Reserve Food! WHERE DO I GET MY NOVUS LE FENNUX? The Wishing Well exists only on the Fennux Sim. We have 1 setup next to every Crafting Machine, and of course these Wishing Wells are used to turn any 12 Fennux Dens into 1 Novus LE Den (and 12 days of Reserve Food). 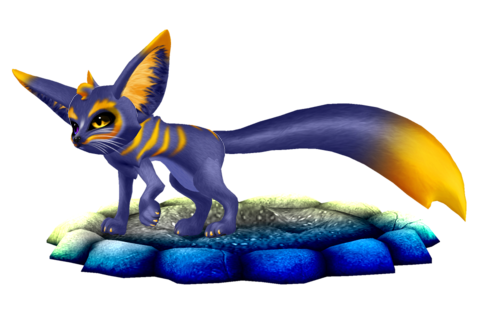 Most Fennux however will have regular eyes from a starter den, very similar to Crafting – the only thing that is “LE” on most Novus LE Fennux is the over-ride of the Fennux Coat. It’s more-or-less exactly like Crafting, except for the fact the coat will not pass. …expect downtime up to 5 hours on either of these days, our data center which houses our physical servers is moving Fennux Servers to a better environment, it’s for the best. Keep in mind these hours are rough approximations, it may be much less time than this, it may be a little more time. Dec 13 is the CRITICAL time not to mess with Fennux in-world, on December 13 from 8PM to Midnight PDT/SLT, don’t touch your Fennux – it’s just safer that way. Dec 10 is only going to impact the Fennux Website, everything in-world should be fine even when our website is down on this date.